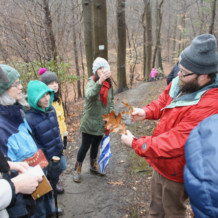 Join us for a winter walk in Glen Providence Park with Naturalist Chris McNichol, as he shows us the park through his eyes. Animal tracks, early-blooming plants, wildlife… who knows what we will find! Chris is a wealth of information on many topics – he teaches boat building, survival skills, rocketry, woodworking, fire starting, foraging, and mechanics at Open Connections, a local homeschool resource center. You can see photos from the wonderful winter walk he led for us in February 2013. As always, kids are welcome! Be prepared for steep hills, and uneven (possibly wet or snowy) terrain: wear your hiking shoes, and bring a hiking pole if you use one… and of course binoculars! To add this event to your favorite calendar program (iCal, Outlook, Google, etc. ), view the event listing on our calendar.